We took these photos in Oklahoma in 1999. We think they show High's heavy bone and muscling better than any others we have seen. Jet black, straight legs, beautiful head, nice to be around. He stands 15.3 and he weighed about 1,250 pounds when these photos were taken. And did we mention he was fast? With a speed index of 105, he tied the track record at Oklahoma City at 300 yards. 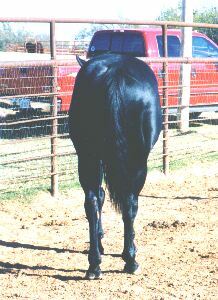 You have to get out of the gate fast to do well in the shorter races, and that is just what we need for barrel racing. 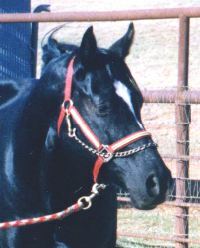 His sire, On A High, had a great race record, which included winning the prestigious All American Futurity. He earned a speed index of 113. You can click on his name in the pedigree for more information. 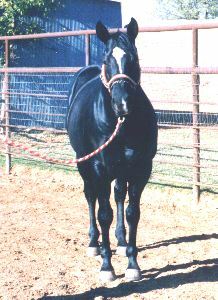 High's dam is an own daughter of Lady Bug's Moon, a horse that has been in the pedigrees of winning barrel horses for years. 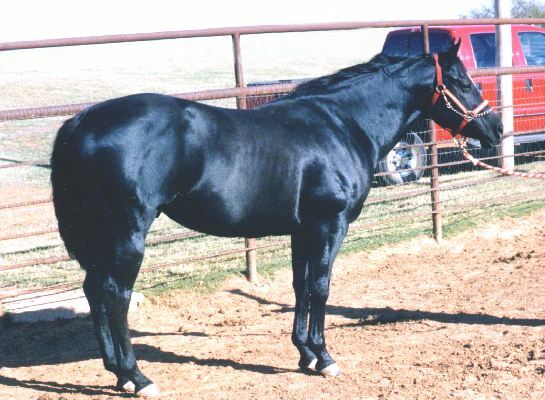 In 2001, Lady Bug's Moon was ranked number 11 in the top 50 Maternal Grandsires list of money winning barrel horses according to Equistat and Barrel Horse News.